We are already 2 months along with our new addition Logan. Before I know it we will be introducing foods to this little guy. It is very important to me that his diet is as healthy and nutritious as possible. 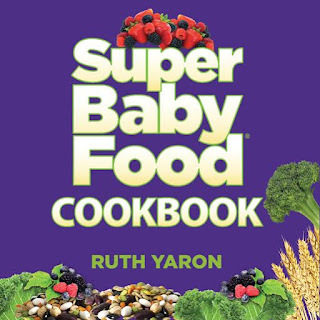 I am so excited to be reading Super Baby Cookbook by Ruth Yaron. She has put together a great collection of fabulous and healthy recipes from beginning foods on up for baby. Most are easy, and fairly fast to make. One of the best features is a colored picture of each recipe so you know what your finished food should look like. She also includes a 'extra healthy tip' for most recipes with a great modification you can add to boost the recipe. I can't wait to start making all of these foods for my little guy! *Nutritious, delicious and easy to follow recipes that include favorite ingredients such as kale, quinoa,legumes, oatmeal, yogurt and avocado, as well as “healthy extras” such as kelp, brewers yeast, tahini,coconut oil, cinnamon, and many more. Middle, French Toast Sticks, Whole Grain Pancakes, and Easy Granola. * Healthy, delicious meal recipes for older baby and toddler including: Easy Mac & Cheese, Tofu Lasagna, Kale/Rice Casserole, Mr. & Mrs. Sweet Potato Heads, and Avocado Soy Patties. * Ready for finger foods? There are some great snack recipes: Kale Chips, Tofu Fingers, Apple Smiley Face, Quick Bread Sticks, and Avocado Cube Salad. For more information visit Ruth’s web site (www.SuperBabyFood.com) or follow Ruth Yaron on Twitter or Facebook. You can purchase Super Baby Food Cookbook at your local book retailer or online at stores like Amazon. Mashed ripe bananas are my choice. As above ripe bananas and in my day rice cereal. Sweet potatoes are my favorite first food to feed my little one! I really like your writing style and how you express your ideas. Thank you.